A special day of peace is the birthday of Mahatma Gandhi, International Non-Violence Day. For the birthday, the Dalai Lama commented that non-violence is always important in our day to day lives, not just around the world. Peace begins within, then at home doing what we can for ourselves, in the community, and then in the world I think. Church bells, English sparrows chattering, the morning chill of fall, last night’s rain is seeping into the ground and my little dog is staring out the window at the wildly growing mulberry tree in the tiny apartment backyard–it’s a Sunday in Brooklyn, in NYC. Peaceful. I’m appreciating the good around here, and happy to have started a journal again this year, after many years of thinking I was too busy. That’s my current experiment with peace, making peace with memories through writing. I could be anywhere, but I’m also grateful to be in an apartment when the cold weather comes. Not so far away from me here, hundreds of people were arrested walking over the Brooklyn Bridge in the street. My heart goes out to them, but seeing what is happening, I am going to be very careful to walk on the sidewalk and not the street. Just to do my part for peace. I also want to be careful how I speak to people, not just friends. A major contribution to peace is the challenging step of kindness and consideration to people – not just friends but those who stand in opposition to our views, our progress, our walk, if there are any around. I’m not sure, but I think I saw the faces of dear friends among not just protesters but also police on duty at the NYC sites, captured in the beautiful photography of visiting artist, Juan Carlos Hernandez. We are all here together in the struggle for democracy in the US, those out of work, and those working as hard as they can, some harder than they should, for their wages. Thinking about the NYC protests, I would rather be the water that flows around the rocks. I’m not young enough or strong enough to run into conflict head first, but then water always wins in the long run, and can’t be beaten, arrested, or reviled. You just have to love water; I just have to love myself. I think that’s where peace starts for me. So I’m staying out of the crosswalks of the streets and hoping for peace, no, working for peace inside. Then I’ll get to peace outside, if I ever get there…. What do you think about international peace day? Is your role within, or outwardly directed? 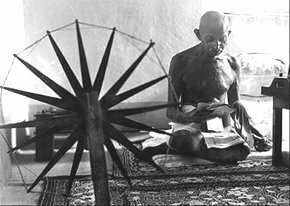 Thanks for the post about Int’l Peace Day & Mahatma Gandhi. Pictures are inspiring from Juan Carlos.